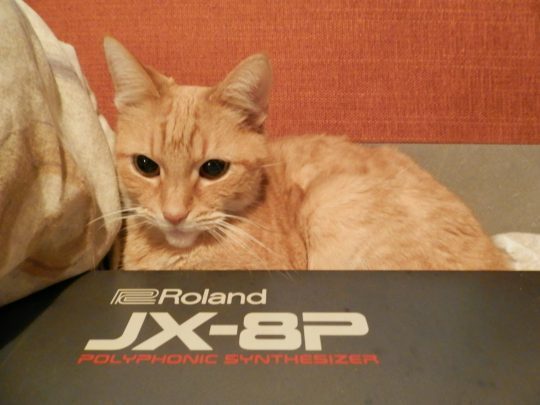 Miep returns to CatSynth, this time with a Roland JX-8P. You can see some of Miep’s previous appearances via this tag. Though it is far more advanced than its predecessor, the JX-3P, the JX-8P has its drawbacks. Hands-on programming is sacrificed and reduced to assigning the parameter you want to tweak to a data-slider near the pitch/mod bender. Enter the PG-800 controller which gives you total control of all the JX-8P’s editable parameters with hands-on traditional slider control. Membrane buttons dominate the front panel of the JX-8P providing access to the various preset and user patches and to page through and assign editable parameters. Posted on March 12, 2018 March 22, 2018 by catsynth	This entry was posted in Cats, Synthesizers and tagged analog, cat, miep, roland, Synthesizers. Bookmark the permalink. Roland is a handsome ginger boy.